You're being watched constantly, at least if you have a cell phone with apps on them. A recently published report showed how seemingly innocuous apps were gathering information about how a person goes about their day. They refresh constantly, collecting data about your location. Now, before I get the predictable chorus of people telling me they'd never ever use a smartphone and that if they did have one they wouldn't enable location data on it, I can call BS (baloney sandwiches) on at least 44% of you because...well...Google tells me this. I get emails from Google every week telling me from what type of devices people access my website. I did not sign up to ask for this information - this is what Google does. An app on the device gathered her location information, which was then sold without her knowledge. It recorded her whereabouts as often as every two seconds, according to a database of more than a million phones in the New York area that was reviewed by The New York Times. While Ms. Magrin's identity was not disclosed in those records, The Times was able to easily connect her to that dot. The app tracked her as she went to a Weight Watchers meeting and to her dermatologist's office for a minor procedure. It followed her hiking with her dog and staying at her ex-boyfriend's home, information she found disturbing. "It's the thought of people finding out those intimate details that you don't want people to know," said Ms. Magrin, who allowed The Times to review her location data. If you have location information enabled on your phone, you're being watched. There are more than 75 companies with apps that know where you live, where you work, where you go to the gym, and many other details about your personal routine. According to the report by the NY Times, these apps are updating with your location 14,000 times per day, pinpointing your location within a few yards. And the businesses involved think it's perfectly fine. "Many location companies say that when phone users enable location services, their data is fair game." Location targeting is a massive, horrifying business, and it's booming. The businesses involved track you, analyze your data, and either sell it or use it themselves. They claim that they have no interest in your identity - they're only looking at your patterns. But those with access to the raw data -- including employees or clients -- could still identify a person without consent. They could follow someone they knew, by pinpointing a phone that regularly spent time at that person's home address. Or, working in reverse, they could attach a name to an anonymous dot, by seeing where the device spent nights and using public records to figure out who lived there. The way they make money is simple - they track you and sell the information to people who want to advertise to you. Then, the people who bought your information use patterns discerned through tracking you to sell you things. The exception to this is Google, which physically tracks you so that they can sell ads to people who want to reach you as opposed to selling your information specifically. Google and Facebook, which dominate the mobile ad market, also lead in location-based advertising. Both companies collect the data from their own apps. They say they don't sell it but keep it for themselves to personalize their services, sell targeted ads across the internet and track whether the ads lead to sales at brick-and-mortar stores. 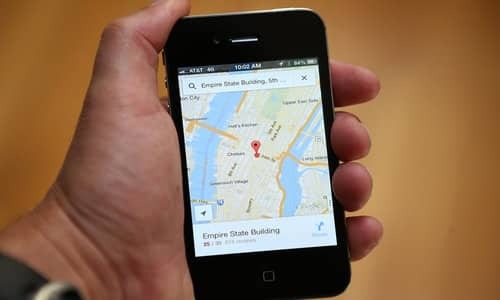 Google, which also receives precise location information from apps that use its ad services, said it modified that data to make it less exact. As a reminder that nothing in this world is actually free, here are some of the "free" apps that may be tracking you right now, wherever you're sitting down to read this article. If you're curious whether apps on your phone are tracking you and selling your information, here's a place you can plug in the name of your app and get a report. The only app on my phone with location enabled was Waze, which, thankfully doesn't seem to be selling my information at this point in time. Basically, every daily habit you have, someone knows if you use a cell phone with the location enabled. Every step you take, someone knows where that step is taking you. Every place you stop at for a period of time - someone knows that too. You know when you add something to your phone or computer and it forces you to grant permission for something that you don't really understand in a long disclaimer that hardly anyone actually reads? Then you click on the little checkmark saying "yeah, sure, whatever?" That's the moment you gave one of these companies permission to track every move you make. Brian Wong, chief executive of Kiip, a mobile ad firm that has also sold anonymous data from some of the apps it works with, says users give apps permission to use and share their data. "You are receiving these services for free because advertisers are helping monetize and pay for it," he said, adding, "You would have to be pretty oblivious if you are not aware that this is going on." But it is easy to share information without realizing it. Of the 17 apps that The Times saw sending precise location data, just three on iOS and one on Android told users in a prompt during the permission process that the information could be used for advertising. Only one app, GasBuddy, which identifies nearby gas stations, indicated that data could also be shared to "analyze industry trends." It's very true that nothing is free. They'll tell you they need your location to identify your favorite sports team or give you personalized weather reports or to warn you of traffic jams, but that isn't the only reason they want to track you. These companies want to collect your information and sell it.